When an opponent’s monster declares an attack: Change all your opponent’s Attack Position monsters to face-down Defense Position. Monsters changed to face-down Defense Position by this effect cannot change their battle positions. Quaking Mirror Force was a fantastic card before Link Format. Another installment of the “Mirror Force Family”, Quaking turned all attack position monsters your opponent had face-down, then prevented them from being switch back to face-up. If your opponent got swarm-happy they payed the price. Locking up their field was a real threat, and with most decks not tribute summoning, the opposing player lost out on monster zones. This card is still quite good against most decks. True King and True Draco tribute, so they can deal, but other decks rarely tribute. Links can’t be turned face-down, so they have an immunity to this card. 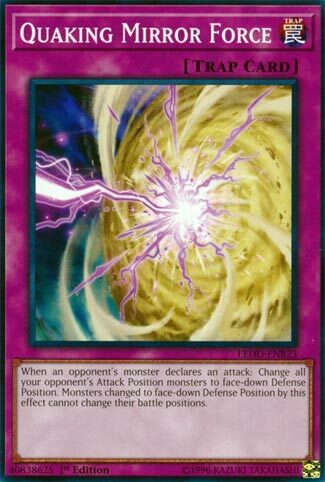 Still, if your opponent has a non-link in their Extra Monster Zone and it gets hit by this card they have locked themselves out of Link Summoning, and that is likely game-altering. Drowning and Quaking Mirror Force go back and forth with which is better. It is up to the player to decide which works best for them. Both are good, both can still be played. This went from awesome to average in one fell swoop. Quaking Mirror Force is a Normal Trap that turns all opponent’s Atk position monsters into face-down Def position if they declare an attack. Those monsters are stuck that way unless another effect fixes them. The main problem is that Links happened. That’s a whole class of monster that cannot exist in Def position, so Quaking does nothing to them. It was a good Side Deck option, and it still is, but Storming and Drowning do more to more decks. The card is in the Cyber Dragon deck, but it isn’t really a Cyber Dragon deck. It is a pretty generic card, Quaking Mirror Force. When your opponent declares an attack, you set all Attack Position monsters your opponent has, and they cannot change their battle positions. Link Summoning hinders this, as Link Monsters cannot exist face-down. However, the card can set other monsters, and set monsters as far as we know of cannot be used as Link Material, meaning your opponent’s board is just clogged up really. Storming Mirror Force becomes better with Links, but Quaking is still very powerful. Quaking Mirror Force takes a new turn on Mirror Force and its family of cards, by not destroying, but changing Battle positions. The Monsters effected by this card change to face-down Defense, and can’t have their positions changed after. What a nifty thing to do. This is a Stall of sorts, but allows you to go on the offensive, and can also be rather disruptive, especially to Links. But this card, at least in my opinion, despite total lack of Mirror Force destruction, still is something you wouldn’t want to attack in to.